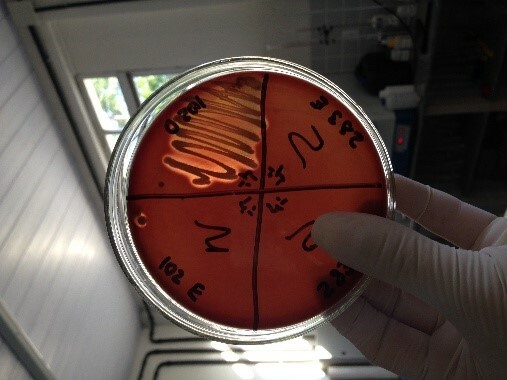 and changes in milk characteristics, which may show lumps, pinkish/reddish coloration or even absence of secretion. 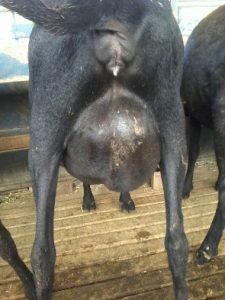 Some severe cases could lead to udder necrosis (“blue bag”) and even death. In subclinical mastitis, the female does not present inflammatory signs, however, due to presence of some microorganisms in the mammary gland milk quality can be decreased. The inflammatory process of the mammary gland can have several origins. For example, traumas and lesions or it can be due to infectious agents, such as fungi, viruses, or in majority of cases bacterial agents. They can cause either environmental or contagious mastitis. 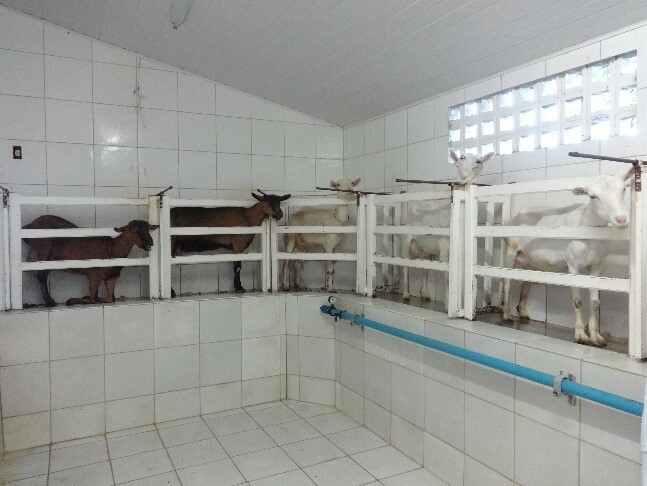 Environmental mastitis is directly related to the hygiene of the places where these ewes and goats remain. Contagious mastitis are associated with transmission between animals and even between human-animal interactions. 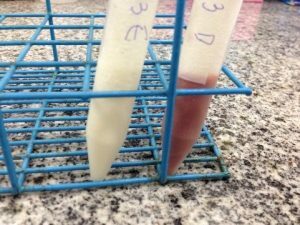 Whereas most bacteria can cause either clinical or subclinical mastitis, Staphylococcus aureus, Pasteurella hemolytica and various yeasts and molds are often recovered from milk samples of ewes affected with clinical symptoms. 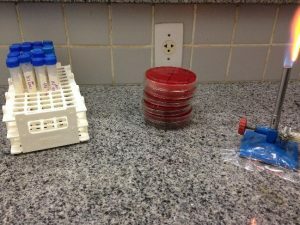 “Blue bag” (clinical mastitis with a hard, cold swollen udder) is typically caused by Pasteurella hemolytica or Staphylococcus aureus. Coagulase-negative staphylococci have been frequently reported to be the most commonly isolated pathogens recovered from cases of subclinical mastitis of dairy ewes. **Ewes with subclinical mastitis produce less quantities of milk and milk with lower quality. The correct management of the ewes and goats in any production system, dairy or meat, is the key point for mastitis control. Preventing mastitis in dairy herds will ensure milk quality, animal health and welfare. Among the most important measures in management of dairy goats and ewes, we can point out the sanitary control of the animals, especially regarding clinical forms of mastitis, separating the positive animals and discarding the contaminated milk. In addition, the adoption of a microbiological-based milking line, pre and post dipping usage, and regular maintenance and hygiene of milking machines are measures that also contribute to better milk quality and animal health. In meat herds and flocks, mastitis control is mainly based on culling animals that present recurrent episodes of clinical mastitis, which directly affect kid and lamb growth. The other general managements are related to hygiene measures that should be part of the property routine, ensuring a clean environment on stables, maternity paddocks, milking parlor, material and equipment used in milking. Mastitis is considered one of the mostly costing diseases in the world, because it directly affects milk quality and its products. In meat herds and flocks, it is notorious for the losses of kids and lambs due to mortality as a result of low nutrition caused by mastitis. Prevention of infection is the key to control mastitis. Good hygienic housing and consistent milking practices are crucial to minimize the impact of this disease. 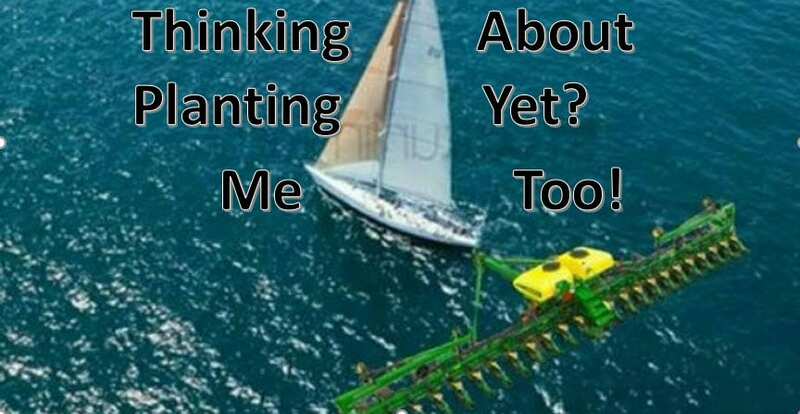 Posted by Sabrina at 2:50pm Posted in Cattle, Dairy Cattle, Goat, Horse, Livestock, Sheep. Bookmark the permalink.